This is an interesting look at the world in which we live. As Principle Digital Imaging Evangelist at Adobe, Julieanne Kost has travelled most of the known world. And during her travels, she’s shot many photographs of the places she’s had the opportunity to visit. While recently looking through the images, she started to notice a pattern in the images she’d chosen to shoot. That pattern was colour. The most successful shoots came from locations where I had unconsciously photographed images which all shared harmonious colors. This observation raised an interesting question. Does every location have a unique, identifiable color palette that can define it? It is indeed an interesting question. And so she decided to put it to the test. She selected her 50 favourite images from each location, trying to find those which best represent the colours of that location. The image above, for example, shows 50 photographs from a trip to Antarctica. Julieanne then brought the images into Photoshop using the Path Blur filter to each, and then selected a small strip from each image to create an array of colour. Julieanne says that initially, her plan was to simply arrange the strips left-to-right across the canvas in the order in which they were captured. But she says that didn’t always lead to a pleasing final result. So, she decided to rearrange the strips until they gave her a pleasing look that best represented each location. 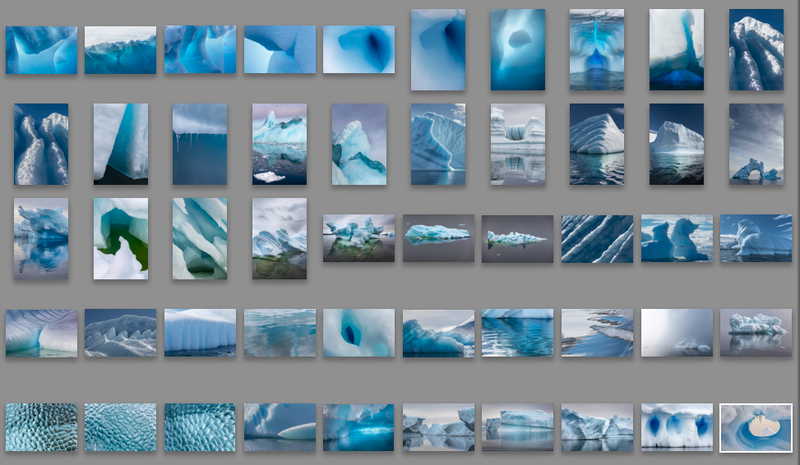 The final result of Julieanne’s Antarctica trip looked a little something like this. It is a very interesting way of looking at the world around us and the places we get to explore. And I think it can be applied to much more than just travel photographs. I’m sure that, for many of us, if we look at some of our own work, the sessions we’ve shot, we’d see similar patterns. Things that have attracted us to photograph one thing over another due to their colour. Seeing the colours laid out like this, all complementing each other, no matter how wildly different some of them may seem, can offer some great inspiration. It displays a cohesiveness that can give us a lot of ideas when it comes to forging our way forward. It might even be a good experiment for building our portfolios, to see which images “belong” to part of a larger piece to form a cohesive body of work. For Julieanne’s project, though, it’s crazy just how much the colour can change in different parts of the world. The three examples above in Antarctica, Copenhagen and Berlin all work very well, but they’re all very different from each other. Perhaps you really can define a place by its colour scheme. If you want to find out more about Julieanne’s project, and see some more images from the set, head on over to the Adobe Blog. It’s a fascinating read.